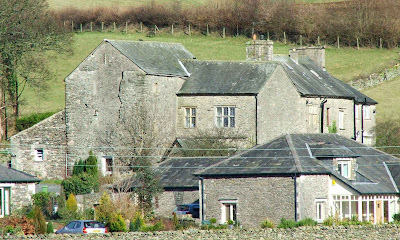 Skelsmergh Hall lays just off the A6 about two miles North of Kendal. Above. 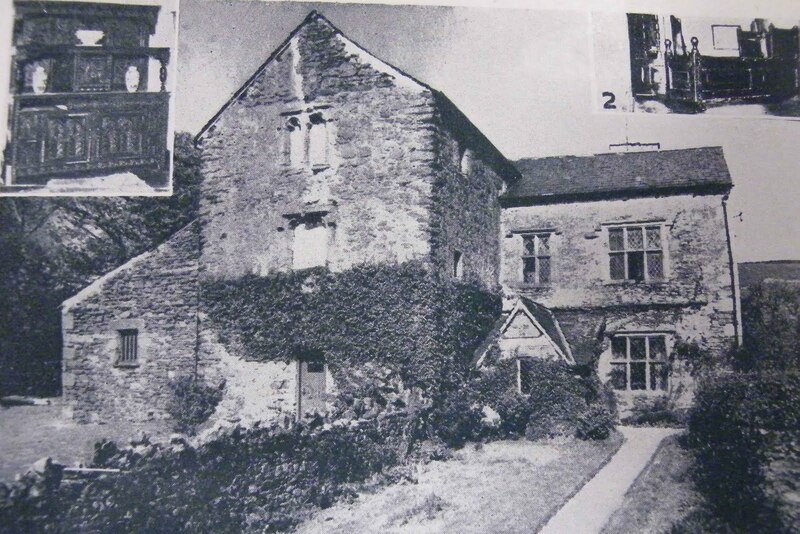 An old photo showing the now missing windows in the gable end wall. The tower was built in the early 15th century (exact date unknown) but the site was of importance to the de Leyburne family from the early part of the 13th century after the land was granted to Robert de Leyburne by the Barons of Kendal, probably William de Lancaster. William was Baron of Kendal from 1220 to 1246, so the land was granted sometime in this 26 year period. Above. 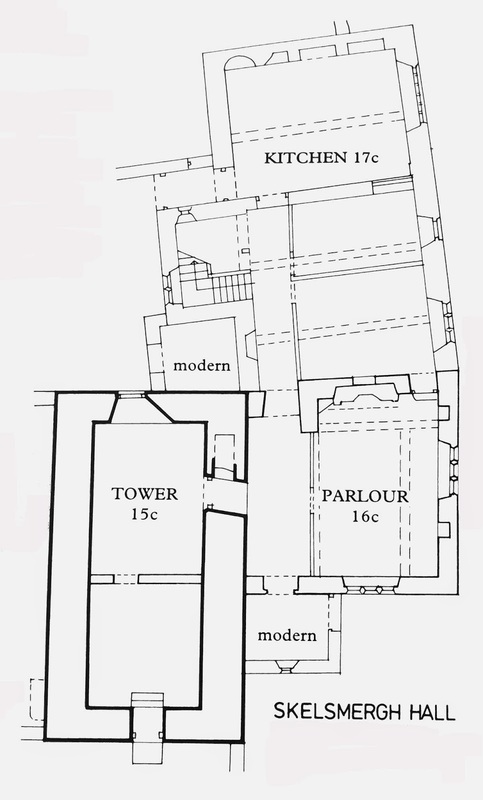 Floor plan of the hall as it is today. The tower remained in the de Leyburne family for the next four hundred years. 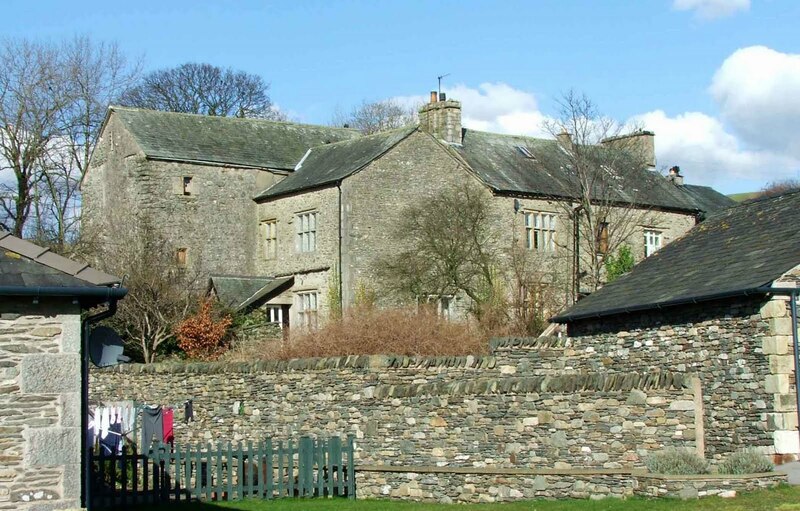 Their principle residence however was at Cunswick Hall near Kendal, another hall with a pele tower and gatehouse. This tower was, however, demolished at some point, with only the gatehouse now remaining. During Elizabeth I's reign, the manor of Skelsmergh was sold to the Bellinghams of Levens and the Braithwaites of Burneshead (Burneside) The tower however was retained. The tower is around 40 by 23 feet, and stands complete to three storeys over a vaulted cellar. The walls in most places are around 1.5 metres thick, although they are only around 1.2 metres thick just above the ceiling of the cellar. The tower is thought to have been more comfortable and luxurious than other towers in the area, perhaps indicating that it was built as a symbol of power and wealth rather than a purely defensive structure. Above. 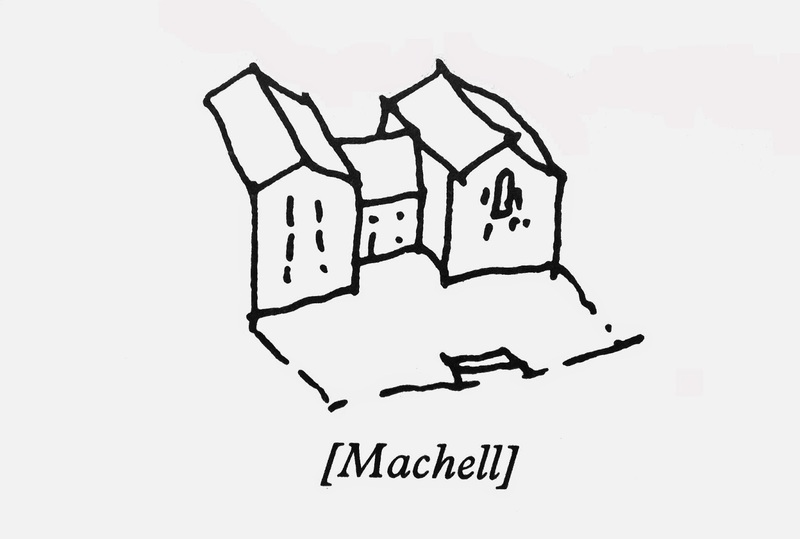 Machell's sketch showing the hall sandwiched between two towers. There would originally have been a second tower, to the right of the middle building shown in the photograph below. An early drawing of the site shows a low two storey hall (still in existence) with a three storey tower each side of it..an H plan dwelling, with at least the left hand tower providing some sort of fortified protection. Take a look at Preston Patrick Hall for an idea of what this may have looked like. The vaulted cellar was used until quite recently as a dairy, and is still intact. The other three rooms in the tower are all connected by a circular stone staircase in south east corner. The third storey however, is now no more, with only a few beams marking where it would have been. The removal of the third storey, also means that the two light window has been removed, possibly to maintain the integrity of the building as a whole. 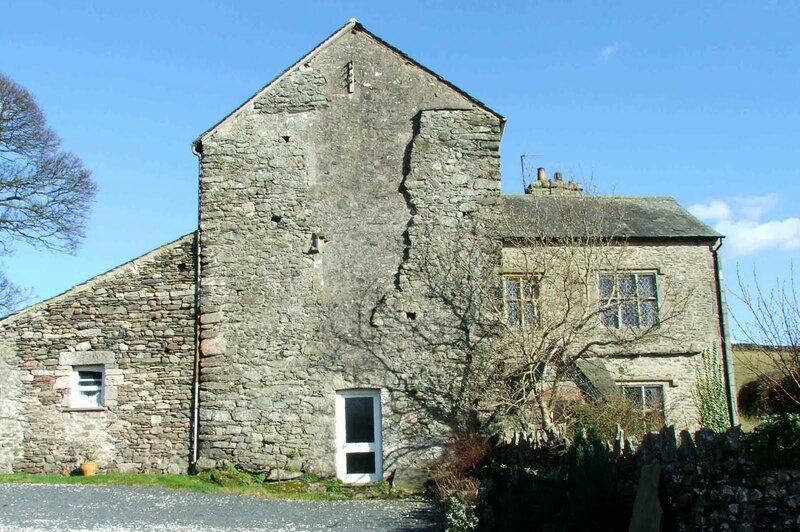 A photo presented in The Medieval Fortified Buildings of Cumbria, by DA Periam and J Robinson clearly shows a two light window on the first floor and one on the second floor. To get an idea of what these now missing windows looked like, take a look at Helsfell Hall. Around the middle of the 16th century, a two storey block was added to the South corner of the tower, with further additions being built in 1629. Prior to the tower being built, a chapel dedicated to St John the Baptist was situated behind the present farm. A stream ran through the chapel, fed by a spring, again dedicated to St John the Baptist. A wooden floor was laid over the running water. Nothing now remains of the chapel or the accompanying cemetery. The Leyburne family held the hall until 1715, when it passed to the Crown as a forfeit when John de Leyburne backed the cause of the Earl of Derwentwater during the Jacobite rebellion. The tower was sold to Thomas Crowle, a lawyer from Hull, who later sold it to Daniel Wilson of Dallam Tower. These days the tower is privately owned, but is viewable from the main road and also in the cul-de-sac down which it stands. It retains many of the original windows, but is now without its parapets. It would seem that Skelsmergh Hall once belonged to the Yeats family as indicated by this quote from the Lancaster paper of the early 1900s. John Welch went to Kendal parish church to be married by licence, on January 26th 1777, the bride being Elizabeth (Betty as in the register), a minor, daughter of Henry and Mary Yeats, of Skelsmergh Hall – of the same stock, probably, as the Yeats family of Beetham, one of whom was the mother of a celebrated barrister, John Bell, KC, senior wrangler at Cambridge in 1786. John Welch’s brother-in-law, Henry Yeats the younger, removed from Skelsmergh Hall to Ellel, where he died in 1835. Skelsmergh Hall was retained by the Dallam Tower Estate until 1912. The Yeats family would have been tenants. Hi Matthew, I note that you have directed readers to Helsfell Hall for an idea of the original tower windows at Skelsmergh Hall. However - on reading 'Historic Farmhouses in and around Westmoreland' by J.H.Palmer (reprinted 1983, originally privately printed in 1944 and compiled from articles in the Westmorland Gazette)I find that there is a photograph of the end of the hall showing two double window openings arranged one above the other. The windows were more ornate than those at Helsfell Hall although by this time only the top windows remained and these had been walled-up. They are described in the text as 'Late Decorated type windows, trefoiled and cusped, under flattish two centred arched heads and surmounted by a square label with three-quarter round moulding'.